I am Dave Siegel, a professor of marine science at the University of California, Santa Barbara. I have been working for many years to implement the Export Processes in the Ocean from Remote Sensing (EXPORTS) oceanographic campaign: a coordinated field effort to understand the interactions between life in the sea and Earth’s carbon cycle. Last Thursday night, I watched “my baby” of a campaign sail away, as the Research Vessel Sally Ride left Pier 91 in Seattle for the northeastern Pacific Ocean. While I am the science lead for EXPORTS, it’s not just my baby—it is truly a group effort. Two teams of scientists created the EXPORTS science and implementation plans, with a lot of input from the greater oceanographic community. The result is a campaign comprising more than 50 funded NASA and NSF investigators from nearly 30 institutions and many graduate students, postdocs and technicians, all excellently supported by the masters and crews of two Scripps Institution of Oceanography’s research vessels: the R/V Roger Revelle and the R/V Sally Ride. EXPORTS aims to develop a predictive understanding of the interactions of life in the sea and Earth’s carbon cycle, which is critical for quantifying the carbon storage capacity of the global ocean. The oceans are Earth’s largest active reservoir, or storage, of carbon and carbon dioxide concentrations in the atmosphere and thus helps regulate our planet’s climate. This predictive understanding of the interactions of ocean life and the carbon cycle is especially important as we are seeing that our ocean ecosystems are changing in response to changes in Earth’s physical climate. To do this we need data to test and validate these satellite-based assessments and numerical model predictions. We are trying to tackle a super hard problem—one I believe to be a true grand challenge in Earth System Science. Our approach is simply to follow the money. For ocean ecosystems, that currency is the energy stored in phytoplankton carbon from photosynthesis. The production of phytoplankton carbon is nearly balanced by its consumption by animals called zooplankton, which in turn provide the energy for the higher trophic levels of the sea, such as fisheries and charismatic megafauna (whales, seals, sharks, and the like). The slight imbalance—roughly 10 percent of phytoplankton production globally—drives an export of organic carbon from the well-lit surface ocean into the dimly-lit twilight zone beneath. Within the twilight zone, microbes and animals of all description consume this exported organic carbon, utilizing their energy for metabolism. This export of organic carbon from the upper ocean and their consumption within the twilight zone, along with ocean circulation, shape the carbon storage capacity of the global ocean and frame the two major research questions for EXPORTS. Constructing a field campaign to identify and quantify the flows of organic carbon through the ocean is, of course, a major challenge. 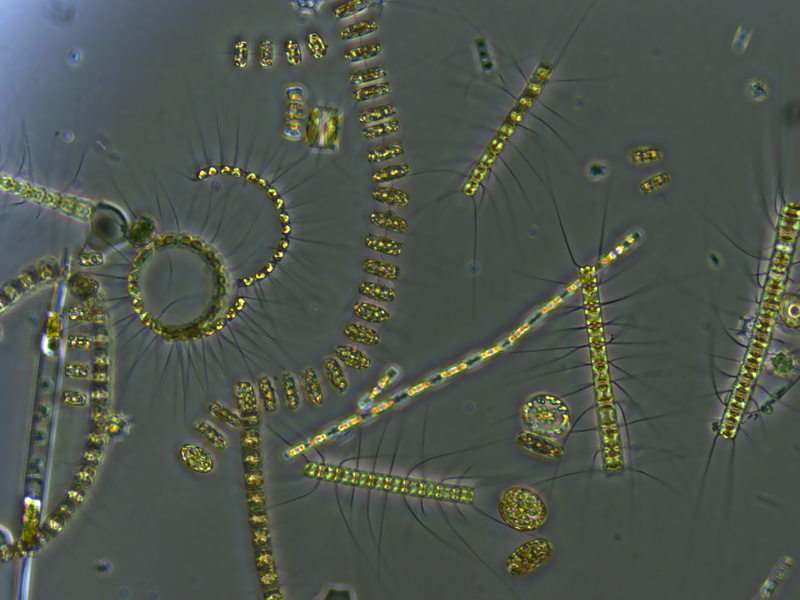 Phytoplankton physiologists need to assess phytoplankton growth rates and responses to perturbations in their required nutrients (nitrogen, phosphate, silica & iron). Zooplankton grazing and the carbon cycle impacts of their daily vertical migration to the sunlit layer of the ocean from the twilight zone need to be assessed. 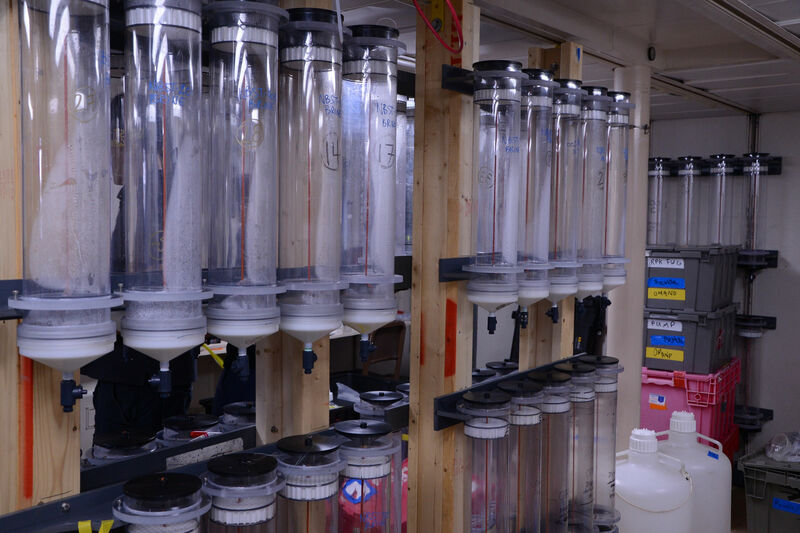 Sediment traps that catch the rain of sinking particles measure the flux of sinking carbon as well as make detailed geochemical measurements that test how well our measurements of the individual pathways reflect the large-scale mass budgets needed to build and test satellite and computational models. Optical oceanographers make ocean color measurements that link the EXPORTS datasets to NASA satellite data products. And I feel bad that I left out so many other individual research activities going on, but mentioning each of them would take up another two paragraphs! The measurements needed to constrain the various food web and export pathways as well as adequately sample the highly variable ocean environment requires technologists that can overcome these challenges. 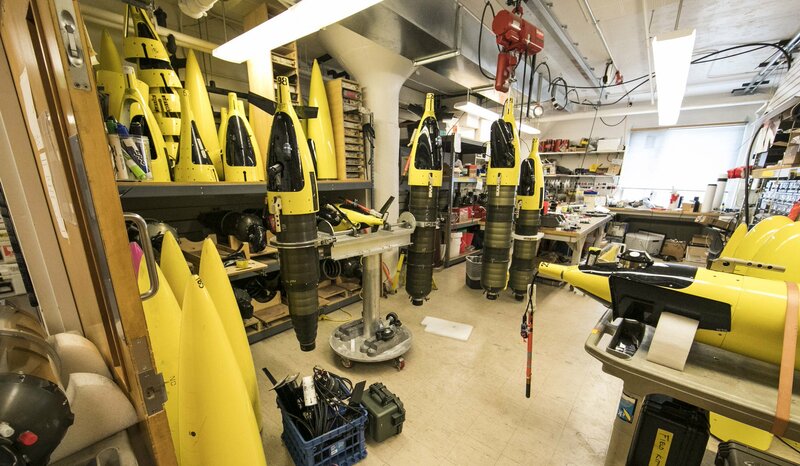 For example, the EXPORTS team includes robotics experts who build, deploy, and analyze data from an array of autonomous underwater vehicles (AUV) that sample ocean properties on time scales ranging from minute to years. EXPORTS has also taken advantage of recent technological advances such as novel high-throughput microscopes and in situ imaging devices that take individual images of billions of phytoplankton cells as well as zooplankton and other various organic matter. 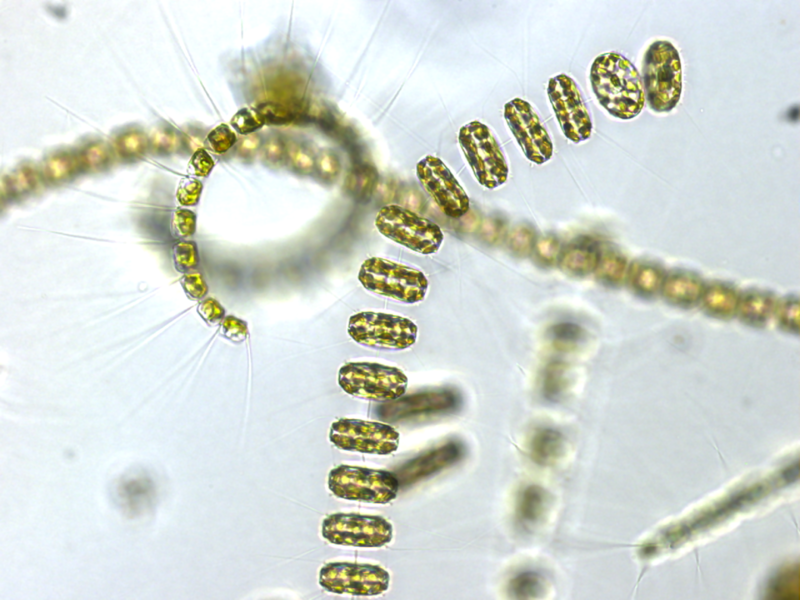 These images are then analyzed using advanced machine learning techniques to provide unique views of the structure of plankton communities. Advancements are also available from the biomolecular sciences where metagenomic and bioinformatics approaches provide complementary ways to characterize plankton communities and their metabolism. Lastly, several projects include numerical modelers who will use computational approaches to help answer EXPORTS science questions. The first EXPORTS field deployment will be to Station P (50N 145W) in the Northeast Subarctic Pacific Ocean. Station P (or PAPA) has been sampled and resampled over many decades—from as far back as 1949, when it served as an ocean weather station. Presently, Station P is the terminus of the Canadian Line P transect ocean research program and is an area of focus for the National Science Foundation’s Ocean Observatories Initiative project. 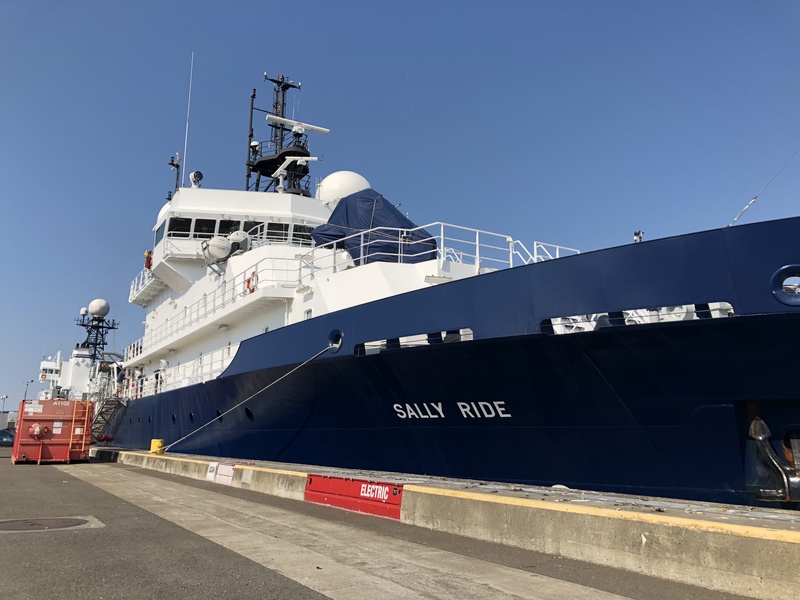 Last week, the R/V Roger Revelle and the R/V Sally Ride sailed to Station P. Both are floating laboratories that enable our research, but they will have different missions. The R/V Roger Revelle will make detailed rate measurements and conduct a wide variety of experiments while the R/V Sally Ridewill make spatial surveys around its partner ship to assess the three-dimensionality of these processes. 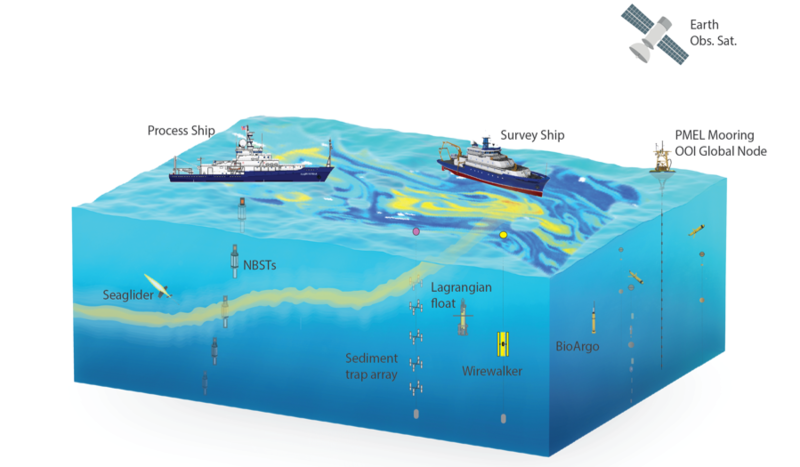 These ship-based measurements will be supplemented by the array of AUVs. Both ships and robots will make ocean optical measurements linking the EXPORTS field data to present and future NASA ocean color satellite missions. EXPORTS is also planning a second field deployment in the North Atlantic Ocean in the spring of 2020 to provide contrasting data. Furthermore, NASA has supported a group of Pre-EXPORTS projects aimed at mining available, relevant data sources for use in EXPORTS synthesis analyses and to conduct modeling experiments to help plan this and the North Atlantic expeditions. So I’m the science lead but I’m not sailing. Seems weird, but early in our planning we were worried about the coordination between all of the things going on. My job back home now is to help coordinate activities on the two ships and assist the four co-chief scientists in fouling off whatever curveballs that may come. I’m sure they will provide blog posts soon introducing themselves. It is been a long time coming and I realized that as the R/V Sally Ride was sailing away. I have been there from the start pushing this along, so I suppose it is “my baby.” I do want to thank all involved in the planning and implementation, including the program officers at NASA and NSF. Further information about EXPORTS can be found at the NASA EXPORTS expedition team blog and the EXPORTS website.